Though there is seemingly an endless myriad of places where clothes can be bought in Sydney, my question is where can cheap, yet trendy clothes be bought? Answers can include op shops, sale periods, favourite stores and their location. Your answer to this question can also be based on the quality of the clothing items, and what you love most about the store in question. Any of the Trade Secret stores are great for getting nice brands at cheap prices (I like to go to the one in the Mandarin Centre at Chatswood). Or, if you want to go even cheaper, you could keep an eye out for clothes swap events around Sydney. With these you bring clothes that you don't want any more (must be in good condition and a quality item) and exchange them for tickets. You then browse what other people have brought, and use your tickets to 'purchase' the item/s that you like. That way you get new clothes without paying a thing, and it's environmentally friendly as well because everyone is recycling their clothes instead of binning them. My favourite inexpensive stores include Cotton On stores, Paper Scissors and Temt, which can be found in most shopping centres. I find that a good way for saving is to keep an eye open for sale times, like the current winter sales which are taking place in most Westfields currently. 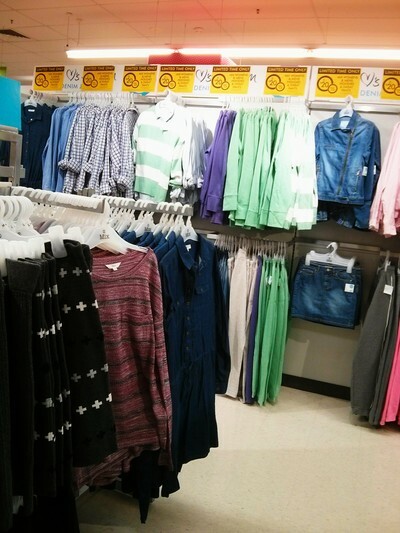 Also, I forgot to mention that the image above was taken in the Coles clothes section. The clothes are actually fairly inexpensive and they still look pretty stylish too!